Good stuff. Last night we made Tomato Basil Pasta with fresh basil, the Italian Heirloom tomato, fresh garlic, onion, and whole wheat pasta. Yummmmm. Today, I ate half of the cucumber. It was so delicious. My parents have an “egg share” and get a dozen “just laid” eggs every week. I stole 2 eggs from their box for Bella. They were so cute…and green. Ooohh…yummy! I got some cucumbers, zuchinni, pole beans and some hot peppers from my friends garden today. He just picked them last night! 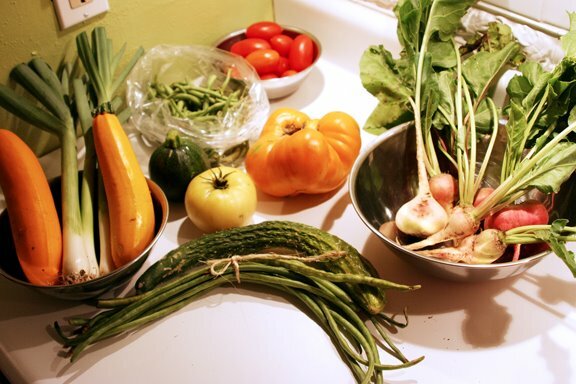 I love fresh veggies…summer rocks!